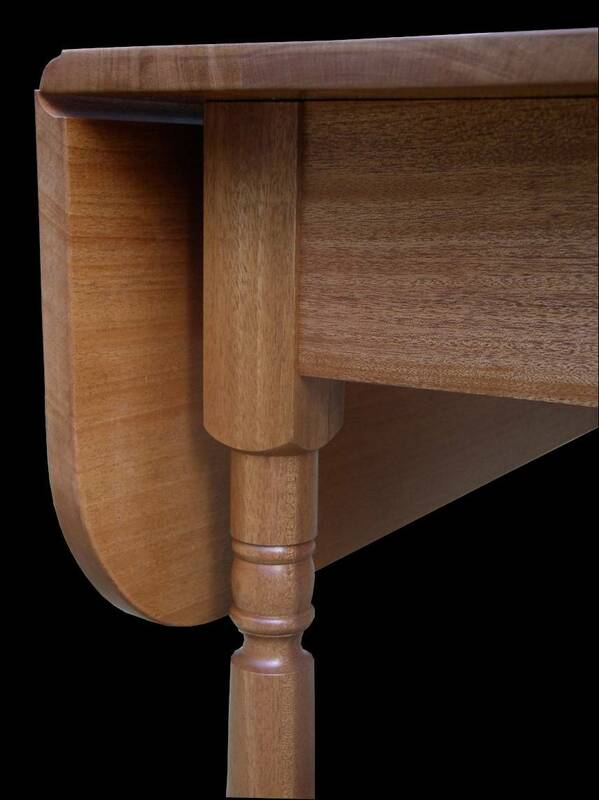 Perfection in joinery is relatively easy to achieve. In the final analysis it requires learning (through instruction and practice) just two things: First, how to mark a line precisely (or perhaps transfer a mark from another line), and second, how to cut to that line precisely. Do these two things well, and your furniture will (at least from a technical viewpoint) be excellent. Perfection (or even coming close) in design is, however, quite another matter. We all have the ability to know good design when we see it. Good design has certain qualities whether or not we can identify those qualities clearly or describe them with words. But knowing good design, and being able to create a good design seem worlds apart for most craftsman today. But where did the “rules” come from, and why were they helpful? How did the pre-industrial potter (or furniture maker) create his or her pleasing design? In his book “The Old Way of Seeing” architect Jonathan Hale explores these questions in the discipline of architecture. (A relevant discipline because most furniture is architecture – just expressed at a smaller scale.) Hale notes that architecture “lost its magic” somewhere between the middle and end of the Industrial Revolution (~1750-1850). A lot of furniture (and pottery!) “lost its magic” during the same time period. Many, though certainly not all, of the “heirloom” pieces of furniture that we value (or copy) today were created before the “magic” was lost. Hale concludes that the “magic” was lost when we lost our ability to see and pay close attention to the shapes, symmetries, proportions, contrasts, gradients, textures and other qualities of the natural world that surround us. These are the very qualities that we naturally relate to, the qualities that feel “right” to us, the qualities that make us comfortable and feel at home because our “home” is the world around us. When we lost the ability to see and pay attention to these qualities in the world around us, we simultaneously lost the ability to incorporate them into our own work. If we do not incorporate these qualities into our designs, then our designs will never feel quite right. They may “get the job done”, but they will never satisfy at a deeper level. They will not become heirlooms that are valued by subsequent generations. If you want to incorporate these qualities into your own work (as I increasingly do), the best place to start is by paying close attention to the world around you. Look at the overall shapes of nature (large and small, in outline and in detail); note how they relate to each other; photograph them, or better yet, sketch them. As you do this, the qualities that are present will slowly begin to work their way into your mind, and from there, into your work. 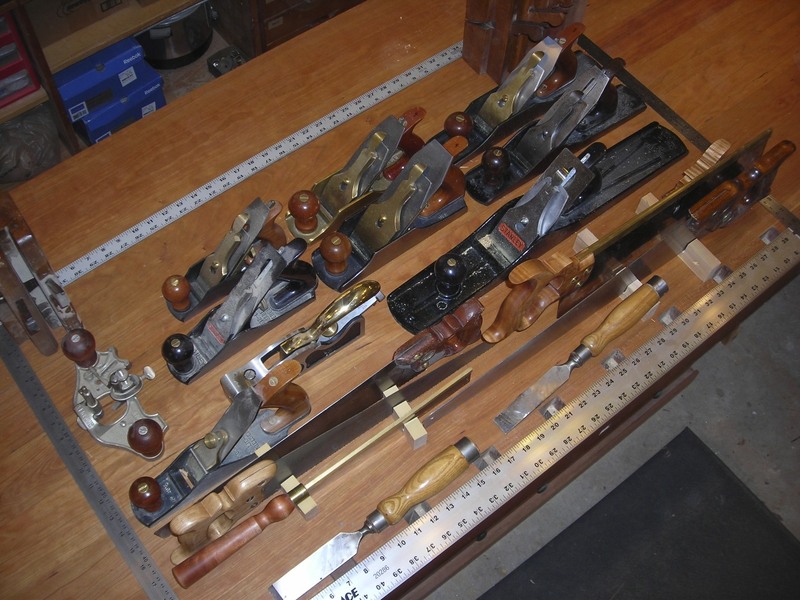 Also, if you have the opportunity, watch George Walkers DVD “Unlocking The Secrets of Traditional Design” (Lie-Nielsen) or check out his website “Design Matters” or read his column in “Popular Woodworking” magazine. He has much to offer along these lines. In a later post I would like to bring some further focus to these important qualities found in nature and how they relate to good furniture design. For now, I leave you to ponder two classical finials and how intimately they are related to plants shapes I found in our backyard. My photoshop skills are not adequate for the task but I think you will be able to see the finial shape and the top flower and bottom leaf (upside down) that make up the first finial. The finial in the second is remarkably close to the overall or outline shape of the leaf. More often than not, it is the overall or outline shape that is important rather than precisely what is done within that shape. The car and the chairs are interesting in their own right, but more often than not it seems that “the shape of things to come” doesn’t satisfy us nearly as much as “the shape of things past.” It seems that craftsman of the past had an almost innate ability to create items with shapes that have endured for hundreds if not thousands of years. In his book “The Power of Limits” author Gyorgy Doczi explores the concepts of shapes that are found in nature. Many of these same shapes appear in man-made items that have endured the test of time. One of my favorite jugs has a salt-glazed base and slip-glazed top which (as a best guess) probably dates from the early 19th century. Careful measurements indicate that the overall shape fits inside a nearly perfect Golden Rectangle (which has sides with a 1:1.618 ratio.) The top portion of the jug is also a nearly perfect Golden Rectangle. In fact, both of these rectangles are within 0.02 units of being perfect Golden Rectangles. This is amazing because I think that the potter arrived at this shape using just his hands and eyes to guide him. I think it is highly unlikely that he used a ruler. He certainly did not use a calculator to arrive at these very precise ratios! The base of this jug is a nearly perfect square, and furthermore, if the top of the jug is bisected by a vertical line, the shape on either side of this line is also a nearly perfect square. And the area of each of these squares is almost exactly 1/4 of the area of the square that creates the base.) Pleasing proportions based on a different approach. In sharp contrast to these two jugs is jug number three. 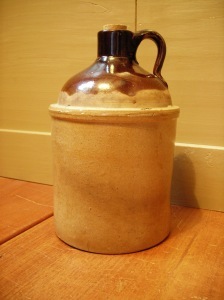 This jug is later in origin and can be dated to between 1900 and 1940 based on the markings on the base. 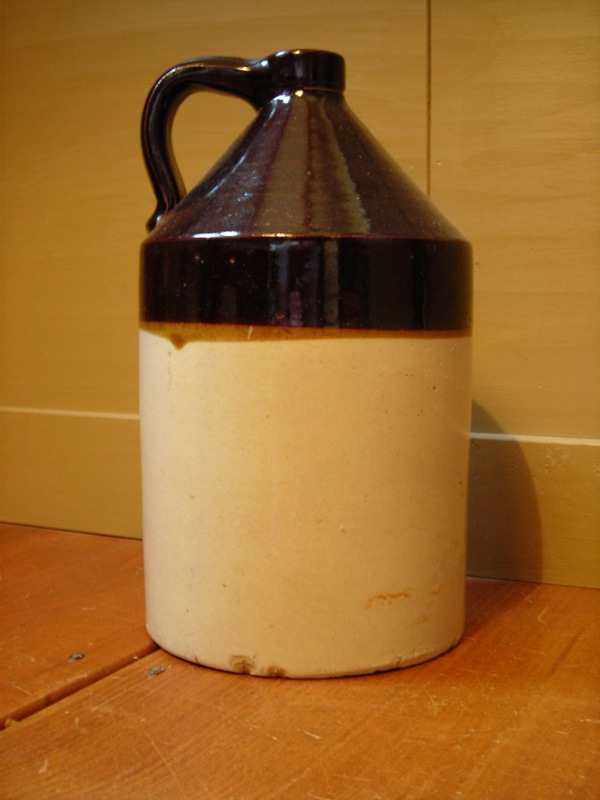 Unlike the first two jugs (which I’m certain were entirely hand-made) it was manufactured by the R.C.P. Company of Akron, Ohio for the storage of whiskey. The overall shape is not a Golden Rectangle nor is it even a 1:2 rectangle. The lighter colored base is only very roughly a square. The same observation applies to the darker colored top. In addition, these two roughly square shapes appear to have no relationship to each other. While this jug is not without some merit, it does not have an interesting and pleasing shape like the other two jugs. (This jug was inherited and has some value for that reason, but it is not a jug that I would normally purchase.) I have asked several people to “rate” these three jugs based on their “gut feelings” about only the shapes. This jug always finishes last. Like a good antique jug, a good piece of furniture (whether antique or new) has to have the right overall shape if it is to be pleasing and satisfying. In the past few months I have tried to sharpen my own abilities to discern and create items with good shape. I think it is critically important to get the overall shape right because I think it is highly unlikely that the later details of the design will be able to compensate for a poor overall shape. Like the better jugs, I think that many of these masterpieces were created not with rulers or by precise calculations of ratios, but rather they were created from the craftsman’s knowledge of good basic shapes and how to combine them in meaningful ways. Good design seems to be both difficult and easy at the same time. Difficult because there are few masterpieces (which suggests that they come only from the few and through much experience and hard work), but perhaps – just perhaps – good design is easier than we think because the actual principles behind the masterpieces are relatively few and relatively accessible if only we can come to understand them and actually use them. Is is possible that by combining Golden Rectangles (1:1.618 ratios), squares (1:1) and other rectangles with small whole number ratios (1:2, 2:3, 3:4, 3:5, 4:5) or Pythagorean rectangles (created with two 3:4:5 triangles) one can arrive at the kinds of overall shapes that characterize the masterpieces, and at the same time avoid the intermediate shapes (like that of the whiskey jug) that don’t quite make it? Remember that these shapes can be combined horizontally and vertically, side-to-side, end-to-end, etc. The possibilities seem endless, but in the end I think just a few rules might apply (though I’m not yet ready to venture exactly what they are!) 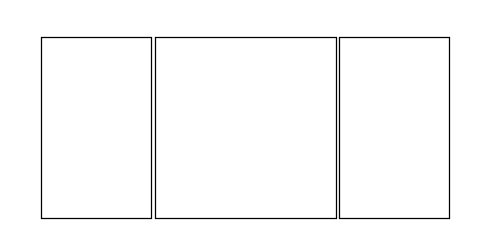 I show just one possibility below: a simple square flanked by two Golden Rectangles. One final thought on design – I frequently visit a local folk art store (think “Country” or “Primitive” decorations here), usually to purchase Olde Century Paints which I like. But whenever I’m in this store I often take the time to look at some of the items of “furniture.” I put furniture in quotes because many of these decorative pieces don’t deserve the label of furniture (being made of particleboard, or having cheap plywood drawers, etc.) However, one thing about them consistently impresses me: the designers of these traditional items almost always get the overall shape right. 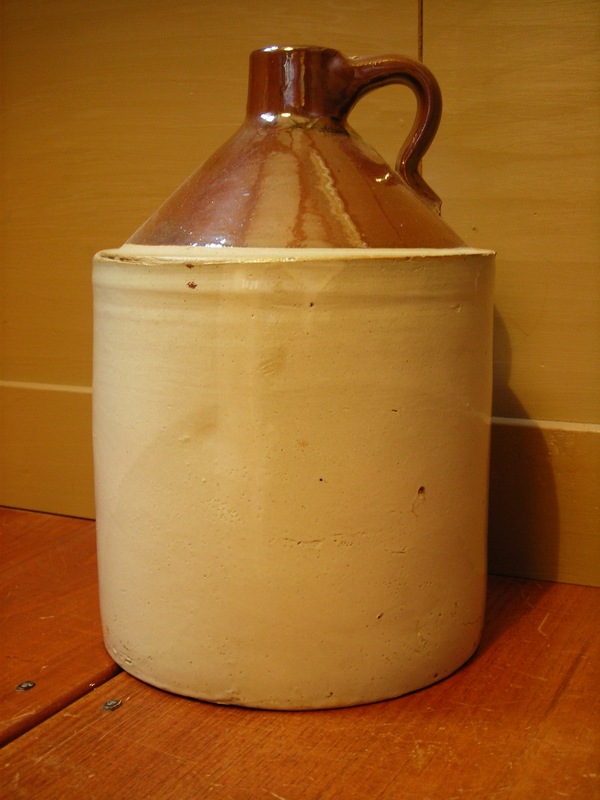 There is something in the “folk” tradition (like with the earlier antique jugs?) that guides the designers. I think these pieces are popular not because of the quality of the work, but because people recognize that the shapes, at least, are right. These items bring a certain desirable look and feel to many rooms. 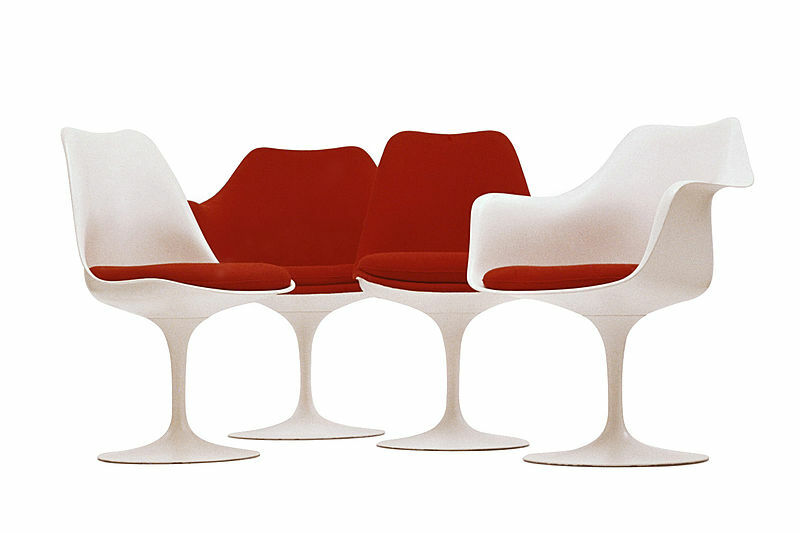 In sharp contrast to these pieces of “furniture” are the offerings found in larger national brand furniture stores. My observation is that while these pieces certainly have higher quality workmanship, they rarely get the overall shape right. 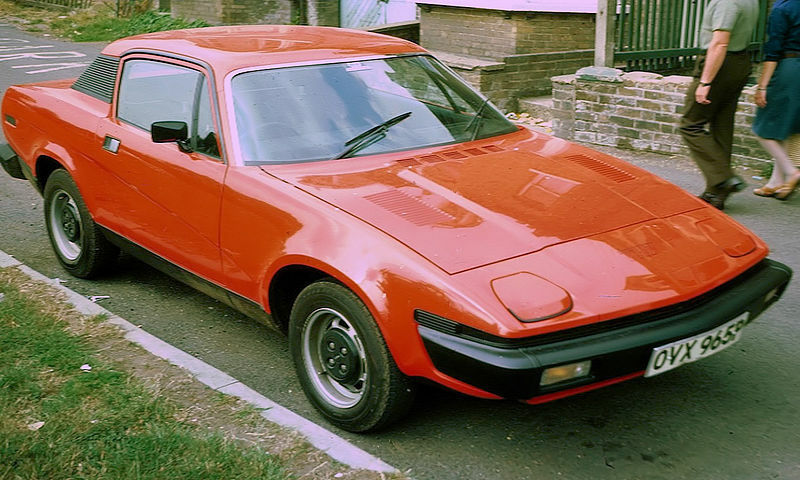 (A little too tall, or a little too squat, or a little top heavy, or a little awkward here or there…) All too often I suspect that the designers have opted for some “average” shape intended to satisfy all, but that in reality satisfies almost no one in the long run. 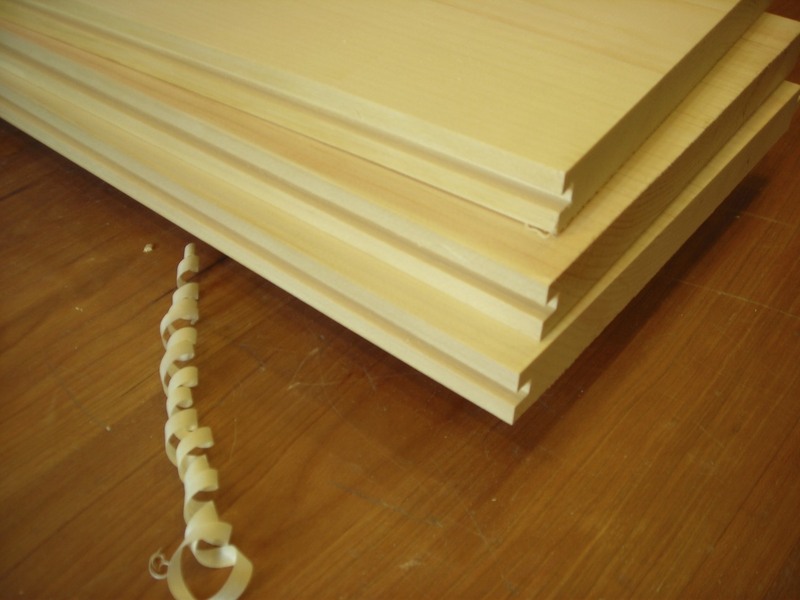 The challenge in making really good furniture is to first get the overall shape right. Once that is done, the path toward getting the details right is sure to follow. I think the basics of good shape are within the reach of most craftsman with just a little work. 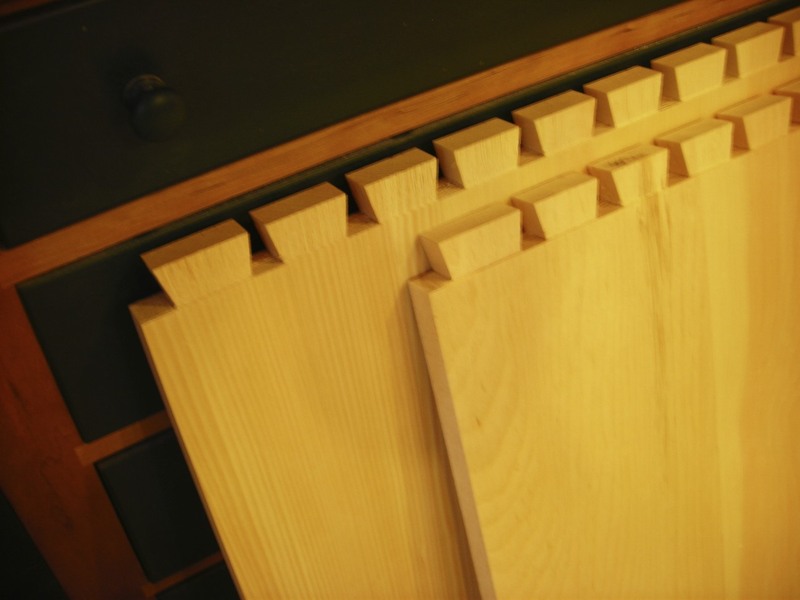 Get the overall shape right; follow through with some equally well-shaped details; then put it all together using some time-proven joinery and construction techniques. Could it become a masterpiece? I think it just might! Will the workshop please come to order! Last Spring when I decided to put my woodworking business into hibernation for awhile, my workshop was about as functional as ever, but none-the-less “out of order.” There were simply too many unused tools, too many storage cabinets and shelves intruding on the space; too many unused jigs and older templates, and way too many scraps of wood that I just couldn’t part with. I simply had to invest some serious time in bringing some order and simplicity to my shop during this time of hibernation. 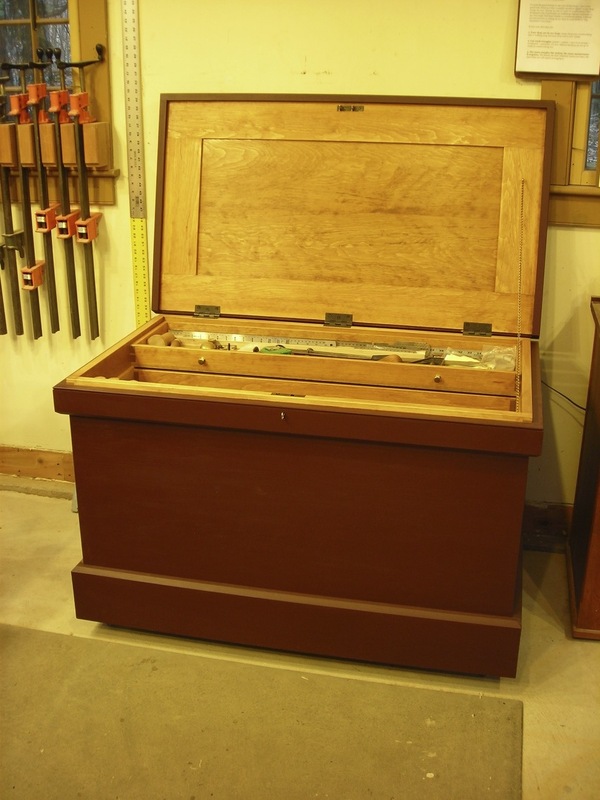 About 15 years ago I had built a traditional tool chest based largely on Tony Konovaolff’s chest published in the October 1990 issue of Fine Woodworking Magazine. Konovaloff’s chest was a work of art and a showcase for his woodworking skills (not necessarily a bad thing), but my desires (and budget!) ran more in the direction of utility and efficient access, which meant “pine and paint” rather than expensive hardwoods. My workshop at that time was upstairs in a barn-like structure with fairly low knee-walls which meant that wall cabinets were really not an option, so this floor chest made a lot of sense. 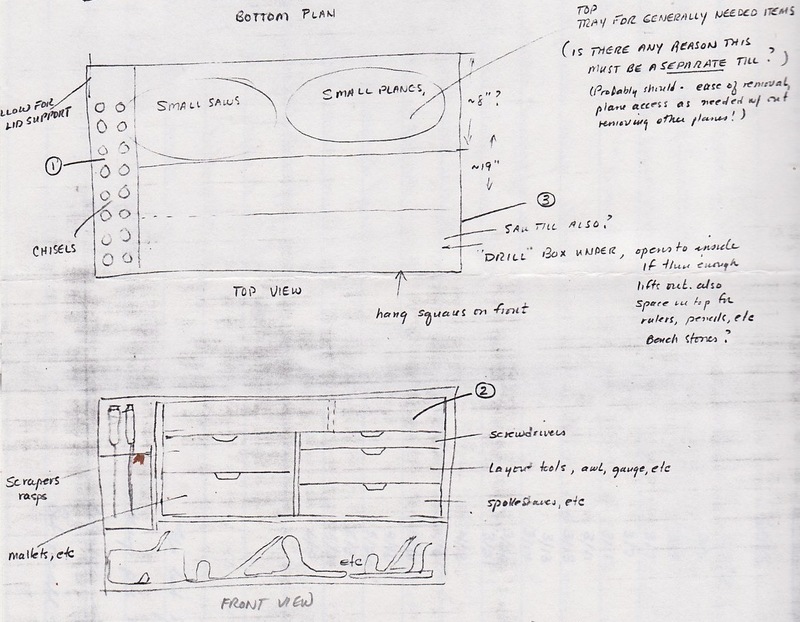 An older notebook page shown below still has the drawings that I used to create this chest. Over the next several years, I built a series of wall cabinets, none of which were particularly outstanding either visually or functionally. At times I wanted to return to the older tool chests, but by that time the shop had accumulated enough stuff that there really wasn’t enough floor space for any traditional tool chests. 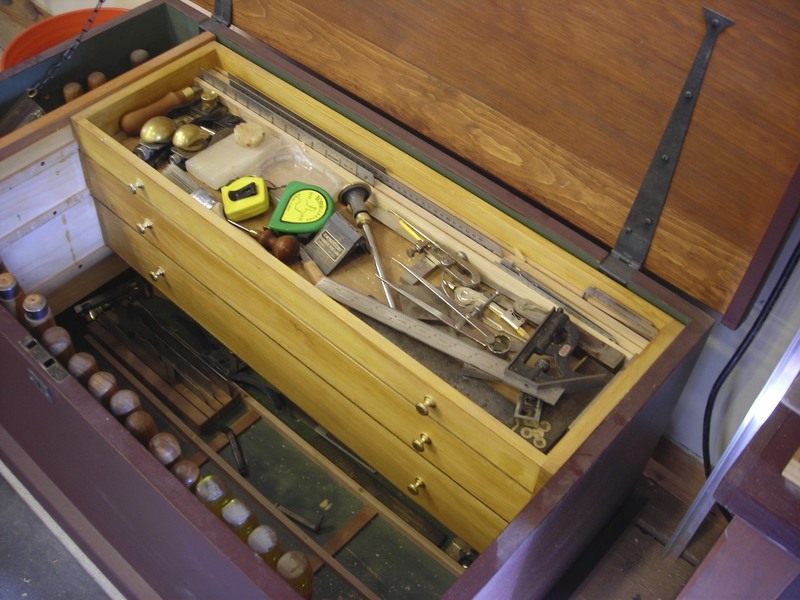 I sort of dismissed the idea of bringing out the traditional tool chests again – that is, until I finished reading The Anarchists Tool Chest and came to appreciate the overall “Rules” that most traditional chests had followed (for good reasons!) The “rules” seemed to fall into three general categories: First that the chest had to be sufficiently full-sized to fit the required tools and to allow good access without having to kneel on the floor ( i.e. just high enough to be able to lean over it with support from one hand). Second, that it had to be well-built including a good frame and panel lid, and third, that it needed sliding trays (not tills with drawers) for quick, flexible access. 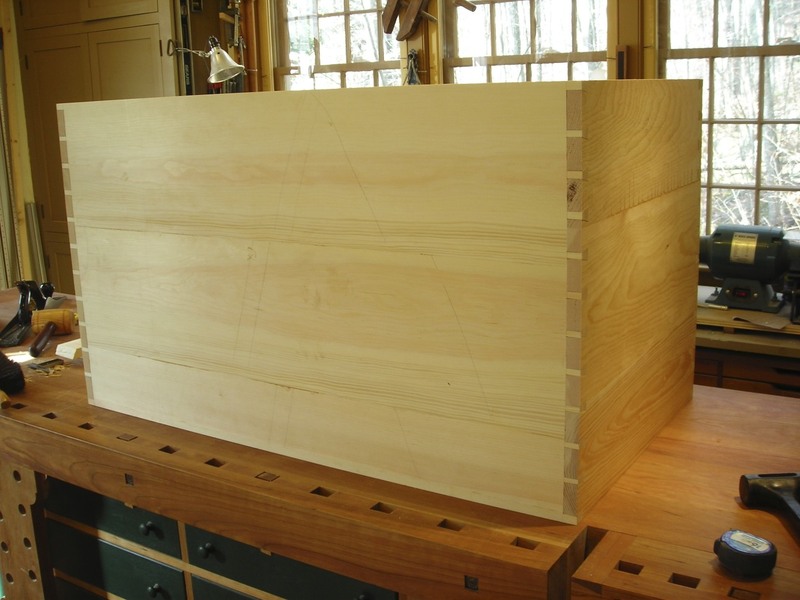 As I was rethinking the workshop, the desire to build a chest like this was as strong, if not stronger, than my desire to return to the older Shaker style bench that I had previously used. In the end, the workbench took priority, partly because I needed additional time to think about the details of a traditional tool chest that would work best for me. I didn’t want to just reproduce the chest in The Anarchist’s Tool Chest. 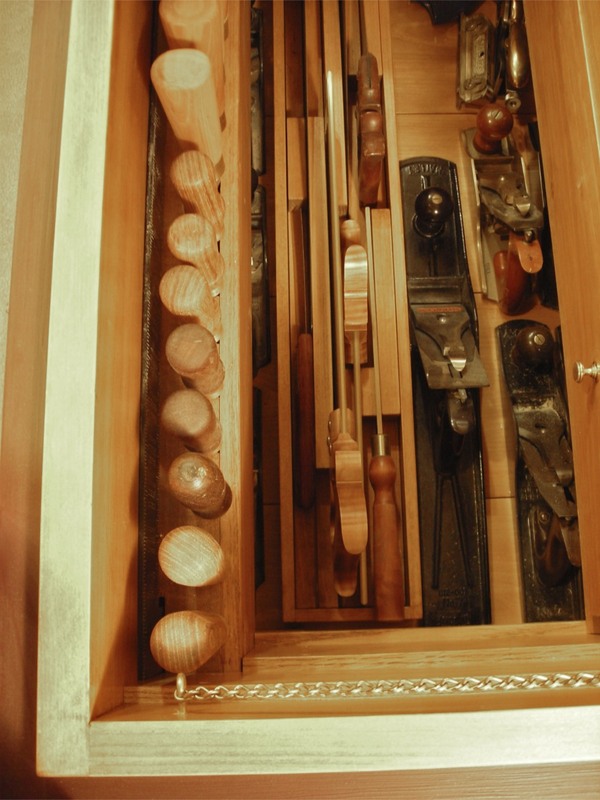 Not all traditional tool chests were identical (for good reasons) and although I knew my chest would need to follow the “rules” if it was to be truly successful, I also wanted my chest to reflect my needs and ways of working. Although I had to limit the actual tools to a sub-set of those I wanted to eventually include, this rough re-working (with some further refinements) proved that the “rules” for a good chest really did result in an amazingly functional and flexible means of storing and accessing tools. 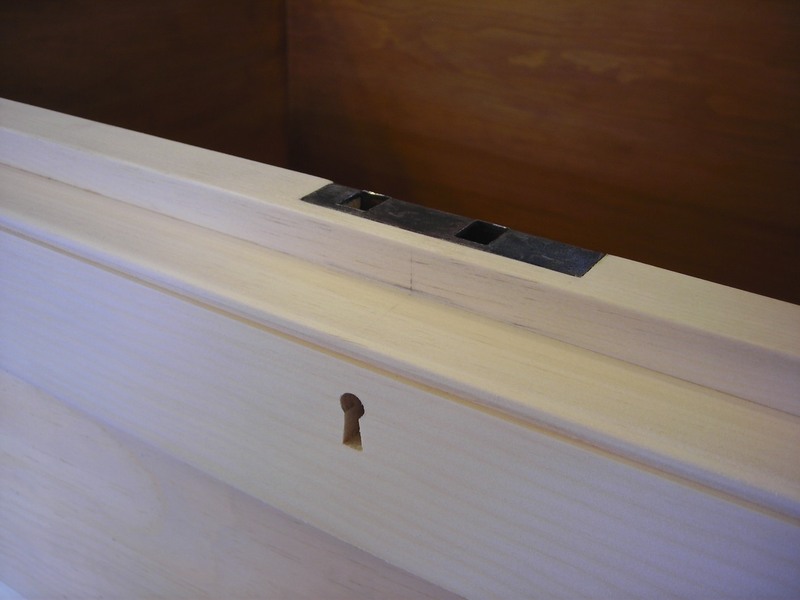 I”ll include a few photos of the construction process, but more than anything I want to note the things that I did differently since they might be of benefit to anyone who is considering building a traditional tool chest customized to meet their needs. For the most part, I used the same construction techniques as in The Anarchist’s Tool Chest, but with some minor differences. I used screws (with square drive heads, no less! – what could be less historical) in slightly elongated holes to attach the bottom. Cut nails are practical and fun to use (and I used some on the lid and bottoms of the trays), but I felt that the screws were the better, though non-traditional, way to go for the bottom boards. I also used brass screws rather than cut nails to attach the runners for the trays (they almost disappear into the background since I stained the interior with a light oak-colored gel stain followed by a coat of amber shellac.) The stain plus shellac produces a pumpkin pine almost like that described in the Autumn 2007 issue of Woodworking Magazine, but with fewer steps and therefore a bit less work. (A word of caution: this tool chest has a lot of internal parts and if I had thought about how many of these parts would need to be stained and finished, I might have opted for the natural look. But on the other hand, I really like the stained interior – it has a sort of aged look and it only had to be done once, after all.) 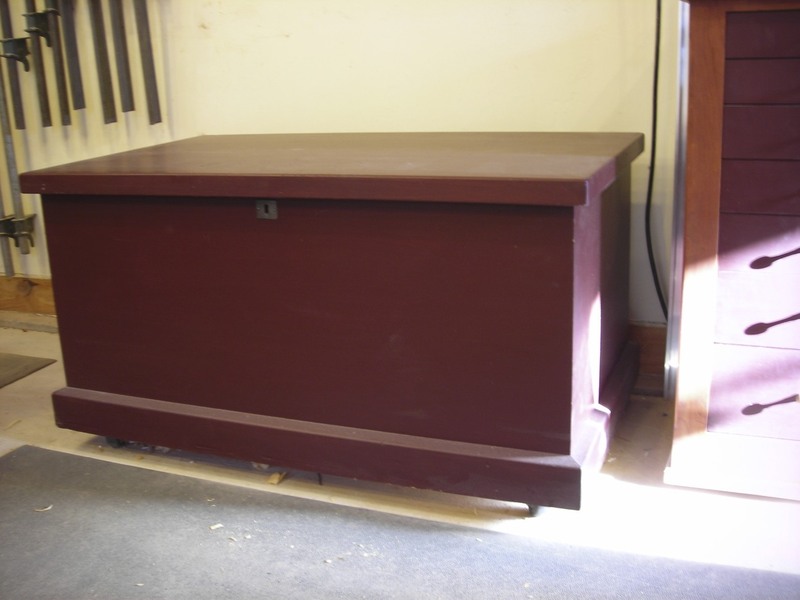 My older chest had a partly stained and partly painted interior which I had always liked. I allowed a bit more vertical space for the sliding trays and opted for different tray heights (about 5, 3 1/2, and 2 inches) because these best accommodated my tools in the locations where I most wanted them. The knobs are strictly non-traditional brass, but I had many of them on hand left over from another project. The most significant departure from the Anarchist’s Tool Chest is in the saw till. In the original layout I left room for all the saws I wished to include, but couldn’t decide on exactly how to include them until late in the process. In my older chest the saws sat in simple saw kerfs on the bottom of the removable saw box. I always had some concerns about leaving the saws sitting in the shallow 3/4″kerfs (were they vulnerable to getting kinked or bending slowly over time?) so I added some additional support pieces which are screwed on from the bottom. The saw till is actually a separate shallow box not attached to the chest, and while it could be removed, there is no particular reason to do so on a daily basis. If it turns out that I don’t like this saw till option, I can always change it. I had a very hard time finding good quality black hinges for the lid, and eventually opted for some very nice (read: expensive) heavy black iron hinges imported from England (available through White Chapel Ltd. Catalog Number 238RHD2 ). I enjoy their quality and don’t regret the unexpected additional cost. Good quality hardware is often more expensive than I think it should be, but almost always worth it in the long run. I did, however, save some expense on the lock by moving it from my older chest to this one. I had planned for an escutcheon, but found that the key for this lock was just barely long enough to reach through the dust seal. I might try to make a longer key some day, but it is unlikely to be used very often. (My two sons are now college age and finally understand that Dad’s good tools – now all in the chest – are only to be used for cabinet and finish trim work – not for rough carpentry, for which there are always other tools available.) I also located the chain for the lid on the right hand side since it is opposite the end from which I will normally access the chest. The Shaker workbench and traditional tool chest have brought a level of simplicity to my workshop that is satisfying in a very deep way, and will, no doubt, influence my work for many years to come. Over the past year I have led a small group in our Church through an extended consideration of simplicity and margin in lifestyle. I’ve led this kind of group several times in the past, but this time my wife and I as well as the other group members have perhaps gone deeper into subject than before. This time, I’ve seen more clearly how the things we own all too often come to own us (and our time.) 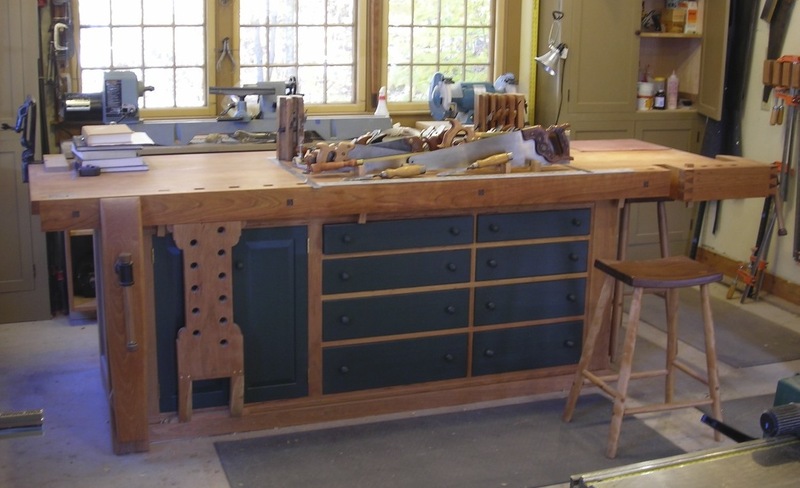 The changes in the workshop (cleaning out unnecessary stuff, re-making the Shaker bench, and bringing more focus to hand tools through a traditional tool chest) have been a good proving ground for greater simplicity. My shop feels less like something that “owns” me and my time, and more like something that will help me pursue woodworking in the future without getting in the way. Our family has always tried to live more simply than our culture might move (push?) us toward, but the past months of change in the workshop have in principle provided an excellent “dry run” for changes that may need to be pursued in other areas of our lives. A few days ago I was perusing the Lie-Nielsen Toolworks web site (always fun to do! 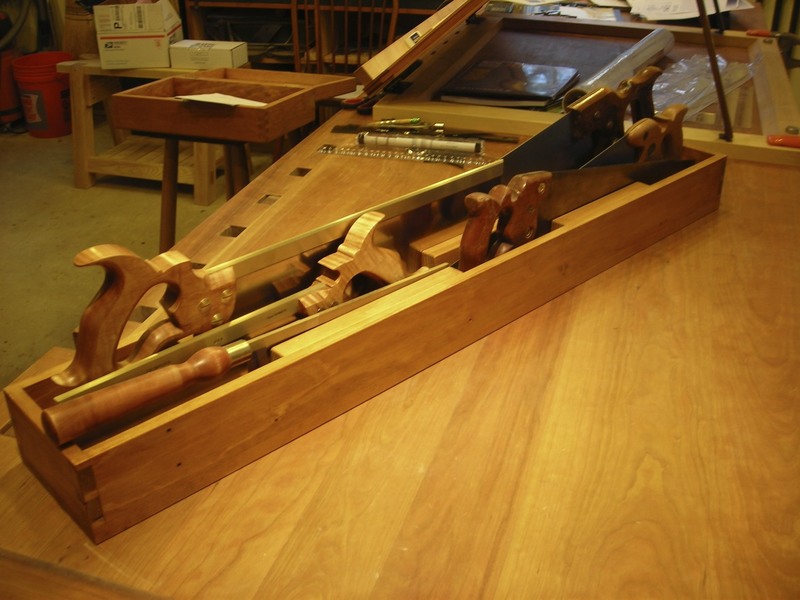 ), and almost by accident came upon a link to a woodworker (Kenneth Copp) who (unknown to me) lives and works in the town of Thorndike, Maine – the very town I grew up in and still visit from time to time. Just a few years ago the Amish established a new and growing community in Thorndike and the adjacent town of Unity after purchasing hundreds of acres of unused farmland. (For more information on their community see an excellent article published in the Bangor Daily News. The workbenches we use shape and influence the type and quality of work we are able to do more than we may realize. My first workbench was a light-weight, portable, foldable Black and Decker Workmate.™ With this bench, a few hand tools, and a skill saw I was able to build a much needed bookcase which has survived to this day and and now houses my wife Judy’s collection of sewing books. 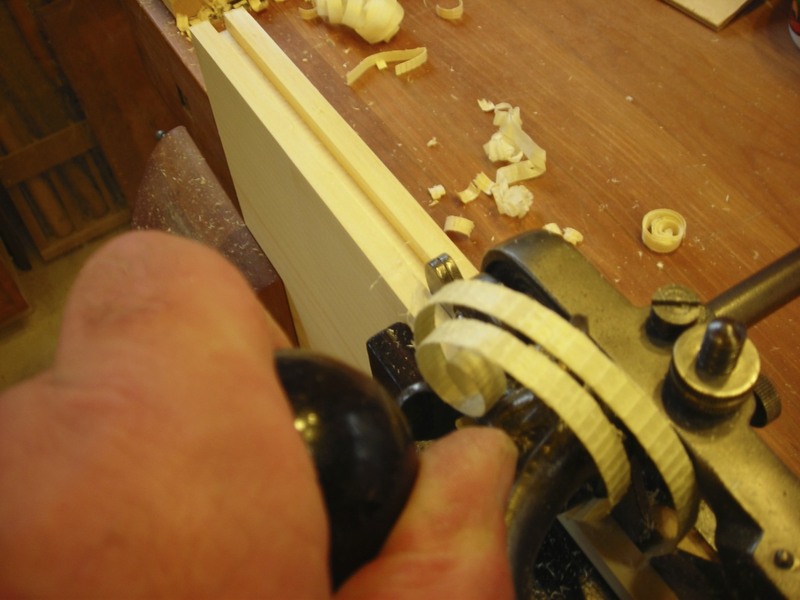 The Workmate ™ was a vast improvement over working on the floor but it was very limited when it came to learning how to finer joinery like dovetails. Building this bench was at the time a very challenging, but also very rewarding project. Although somewhat short and lightweight, this bench (along with Tage Frid’s books) gave me the opportunity to explore better joinery and other techniques associated with fine woodworking. Although I scaled down the original bench to a more manageable 9‘ long x 34” deep bench, it was still rock solid and weighed about 450 lbs. To my delight it handled items from small to large with great ease and greatly facilitated improving my skills as a woodworker. 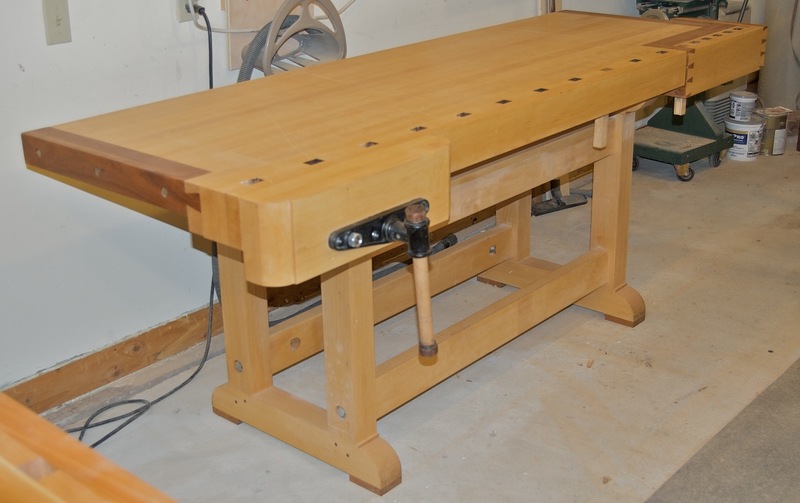 This Shaker style workbench and I developed a long-term and very productive relationship until the year when we moved to a different location where my shop space was less than half the space I had become accustomed to having. After much frustration over working space, I opted to build a smaller bench. The Shaker style bench found a nice home at a nearby woodworking school, but even as it was being disassembled for transport, I knew I would be building another one sometime in the future. The new bench I built was a very traditional woodworking bench. Its design and size were derived from numerous sets of published plans and woodworking articles in various magazines, and like the Shaker-style bench, it too proved to be a very functional bench which I used for about 5 years – but the older bench was never far from mind. After our oldest son Tristan was in college and when our youngest son Brendan reached college age, my wife and I began discussing preliminary plans for a retirement house even though it would be several years away. Our current Bow-roofed cape has been a great house to live in, but from the beginning we recognized it was designed for raising children, not for retirement. Working on this bench has been like renewing an old friendship, but with improvements. The new bench incorporates some features like full extension drawers on heavy-duty slides, a thicker top than the previous bench, and higher quality vise hardware. I think it must weigh over 500 lbs loaded, and it is ideal for hand-planing and other hand work. It will probably be the last bench that I will ever build, but I know it will be a joy to work on in my “improved” current shop and in any future shop as well. Like the other benches, I’m sure this one will facilitate me in growing further as a woodworker. More information on this workbench can be found here.